Left to right: 4Everalone, Radio Rosario, Maz & Brick, Drinking in America. As 2017 draws to a close, thoughts turn to the New Year and Galway theatre goers have much to look forward to from both home-based and visiting companies and theatre-makers. The Town Hall has already unveiled its programme for the next few months and, as always, it sees the year in with festival favourite the Renmore Panto which this year is Beauty and the Beast (December 30 to January 14 ). Lively Dublin troupe Bottom Dog rock up on February 2 with Eric Bogosian’s powerful and hilarious Drinking in America, starring Liam O’Brien from Fair City. February also sees Galway Actors Workshop stage Lucy Kirkwood’s media satire NSFW (Studio, 7 to 9 ) and Decadent Theatre Company stage a new revival of the compelling Frank McGuiness hostage drama Someone to Watch Over Me (main stage, 7 to 17 ) while Druid bring back their superb Waiting for Godot (February 22 to March 3 ). Marty Rea as Estragon, lean as a pencil in his frayed pinstriped coat, and the shorter Aaron Monaghan as the perpetually perplexed Vladimir are a wonderful double act as they pass their waiting time with bickering, puzzling, falling out, and making up, and muddling through the conundrum of life. Rory Nolan is also terrific as the blustering, needy, Pozzo, with Garret Lombard as the woebegone lackey, Lucky. Lucky’s verbal fusillade of a monologue has its special chime of Druid resonance as well, containing the phrase "a skull in Connemara" which Martin McDonagh took for the title of his play. Garry Hynes directs her cast with all her usual assurance in a production that hits all the right notes –well worth catching if you missed it last year, or revisiting even if you did not. 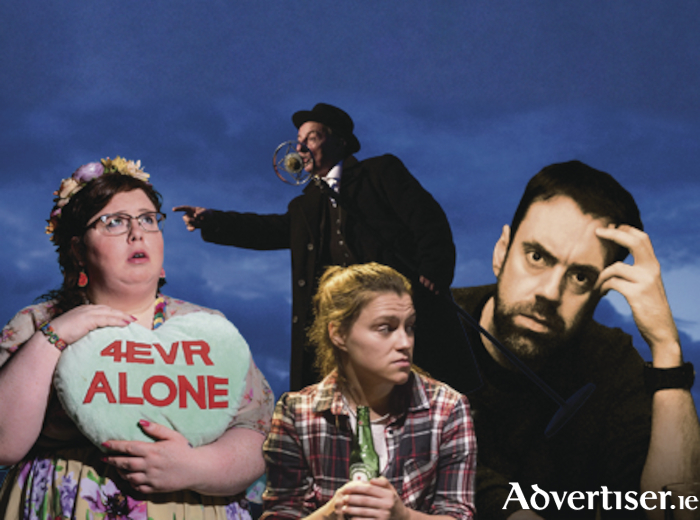 Rising comedy star Alison Spittle brings her latest show 4Everalone to the studio on February 10, while the big show in March sees Enda Walsh and Cillian Murphy reunite for Walsh’s adaptation of Max Porter’s wonderful book Grief is the Thing with Feathers (Black Box, March 16 to 24 and already sold out ). In the book, two young boys are trying to deal with the shock and pain of their mother’s sudden death, as is their father who is a Ted Hughes scholar. Then, into their lives comes Crow, the trickster protagonist of Hughes’ most famous poetry collection. This other-worldly bird is drawn to the grieving family and declares he will stay until they no longer need him. Crow’s arrival, as the most unlikely of babysitters, sets off a story that is by turns heartrending, hilarious, and full of wisdom on coping with death and living with grief. April will see Fíbín Theatre Company embark on a nationwide tour with Tóraíocht, their new version of the epic tale The Pursuit of Diarmuid and Gráinne, written by Philip Doherty and directed by Mikel Murfi. A love story full of outlandish feats and monsters, it moves faster than any car-chase, jumps higher than any vaulter, and loves twice as much as any Frenchman, as Diarmuid and Gráinne attempt to stay one step ahead of Fionn and the Fianna. The story is told through stunning visuals in both Irish and English. All performances will be subtitled in English. Fíbín will kickstart the Tóraíocht tour in the Town Hall Theatre on April 9 with a special schools performance on April 10. Other Town Hall highlights in the pipeline are Gare St Lazare with their latest Samuel Beckett show Here All Night. The work includes original music by Samuel Beckett from the novel Watt, as well as songs, poems, and texts by Beckett with original music composed and arranged by Paul Clark (The Clod Ensemble ). Blue Teapot, all aglow with the success of the film version of their play Sanctuary, take to the stage with a bold new presentation of Brian Friel’s Dancing at Lughnasa in May. Other coming attractions include Fishamble Theatre with hit Dublin Fringe show, Maz & Brick, by Eva O’Connor, and Michael Patrick’s hilarious My Left Nut all about growing up as a Belfast teen with an unfeasibly large testicle. June will see Ger Howard’s staging of that rambunctious Irish classic The Midnight Court, directed by Paul Brennan, while Andrew Flynn’s Decadent Theatre Co will present one of Marina Carr’s plays (either Hecuba or The Mai ) toward the end of the year. The burgeoning Galway Theatre Festival will take place across a range of venues from May 4 to 10 and, while details are still being finalised, audiences can look forward to great shows from both local and visiting companies. One festival show that can be confirmed now is Morgan Creative’s staging of Antoine de St Exupery’s The Little Prince, adapted by Oisín Robbins. The company will also premiere a new play from Christian O’Reilly, Spoiled, in November, with both productions being directed by Luke Morgan. Niamh Ryan’s Caca Dana Theatre Company, whose Eternal Youth was a 2017 local highlight, are planning to do Forgive Us Our Trespasses in September. Mairead Folan’s NoRopes are working on developing a staged feminist retelling of A Little Mermaid as part of Druid's FUEL Programme, its YA award-winning author Deirdre Sullivan's debut as a playwright. The production is inspired by her recently published work Tangleweed and Brine which won Bord Gais YA Book Of The Year Award 2017. A preview will be staged in April while a full production is planned for towards the end of the year. Other writers whose work will be showcased in the Druid FUEL programme include Sarah O’Toole, Jacinta Sheeran, and James Ríordan. Sarah O’Toole is developing a one-woman show about mountaineering, Jacinta Sheeran is writing a piece about food and eating disorders, while James Ríordan’s play is a collaboration with musician Anna Mullarkey and a ‘buffoon theatre’ piece on the theme of charity. The ever-intrepid and tireless Little John is reviving his Radio Rosario in the second half of the year, and also lined up for collaborations with Fidget Feet and The Performance Corporation while he will be starting the year with a follow up show to Small Halls and Potholes. The equally intrepid and tireless Gerry Conneely, from Kinvara, has three shows lined up - revivals of his fine staging of Patrick MacGill’s WW1 memoir, The Great Push, in February in the Town Hall (12 to 17, Studio ); his own charming romantic/musical comedy, Same Old Story, in April, and a new comedy, Fashion Show, about a gladrags jamboree in Bohermore that entices Vogue editor Anna Wintour to attend, which is scheduled for the summer. One wonders whether a show that fictionally has Anna Wintour attend might actually coax Anna Wintour to attend? Gerry, send out an invite to her!